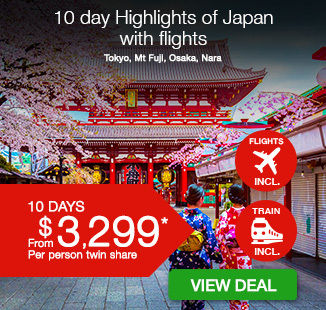 10 day Highlights of Japan including return international flights, accommodation, breakfast daily, professional tour guides, in-depth sightseeing and more. per person twin share |	Typically $6,980! Short on time but want to see as much of Japan as possible? This 10 day Highlights of Japan is for you, including your return international flights, accommodation, breakfast daily, professional tour guides, in-depth sightseeing and more. Arrive into the bustling capital of Tokyo and spend a full day exploring the major highlights of this city such as, Asakura Temple – Sensoji, Nakamise Shopping Street and Imperial Palace Plaza. Be awe-struck by Mount Fuji and the natural beauty of the Hakone region. Travel by train to Osaka and head to the Umeda Sky Building Floating Garden Observatory. Explore the Todaiji Temple, Nara Deer Park and Kasuga Taisha Shrine in Nara. Make the most of your time in the Dotombori & Shinsaibashi Shopping District in Osaka and enjoy the last of the delicious Japanese cuisine before spending your last evening in Japan. See the full list of Inclusions of this incredible tour here. Depart New Zealand today on your overnight flight to Tokyo. Welcome to Japan! Japan’s bustling capital, mixes the ultramodern and the traditional, from neon lit skyscrapers and anime shops to cherry trees and temples. Upon arrival, you will be met and transferred to your Tokyo hotel for check-in. After breakfast, you will spend your full day exploring the major highlights of Tokyo city such as: Asakura Temple – Sensoji, Nakamise shopping Arcade, Imperial Palace Plaza. Lunch is served at the local restaurant. In the afternoon, continue visiting Tokyo Tower, Ginza District, Odaiba area and then drive back to your hotel for overnight. Free day of leisure to explore Tokyo at your own pace. After breakfast, we will meet and transfer to the Pirate Ship on Lake Ashi and then Hakone Ropeway, Owakudani Valley. After breakfast, we will go to Fuji 5th station and board on Mishima train and head to Shin-Osaka (by Shinkansen Hikari No. 473). We then drive to Umeda Sky Building Floating Garden Observatory. In the late afternoon, we drive to the hotel for check in. Free day of leisure to explore Osaka at your own pace. After breakfast, our tour guide will meet you at your hotel lobby and head to Nara to explore sight such as: Todaiji Temple, Nara Deer Park, Kasuga Taisha Shrine. Lunch is served at the local restaurant. In the afternoon, continue exploring Osaka Castle, and spend your time at Dotombori & Shinsaibashi Shopping District. In the late afternoon, we return to your hotel for relaxing and overnight at hotel in Osaka. Today you are free at leisure until we depart for the airport for your flight home. $622 per person in addition to the twin share voucher. * Departures in March, April, October and November incur a peak season surcharge of $330 per person. ** Departures in January incur a peak season surcharge of $440 per person. Return economy airfare with Malaysian Airlines, Cathay Pacific Airlines, Qantas Airlines or similar.